“What? 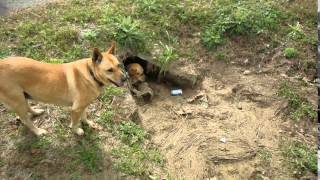 I didn’t do it!” says the yellow dog. 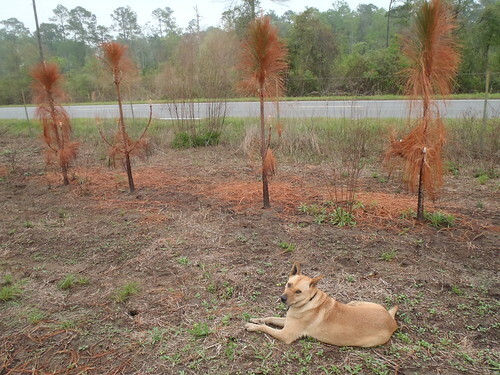 This entry was posted in Canopy Road, Longleaf, Plants and tagged 28 March 2011, dog fennel, Eupatorium capillifolium, Fire, Georgia, John S. Quarterman, Longleaf, Lowndes County, Pinus palustris, prescribed fire, Quarterman Road on March 30, 2011 by John S. Quarterman. 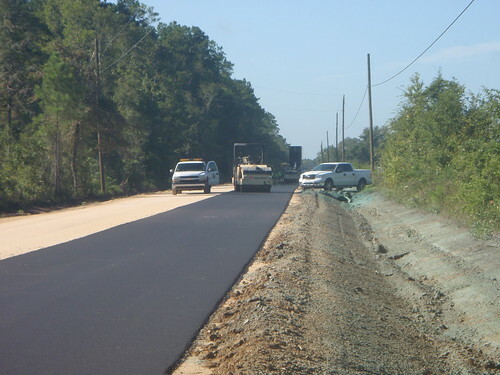 Quarterman Road in Hahira was paved within the last year. Some people who live there say people drive faster than the posted 35 miles per hour limit. The Georgia Department of Transportation says this type of paving is safe for up to 45 miles per hour. Lowndes County agreed to lower the speed limit to 35 miles per hour after they heard concerns from residents. Since GDOT says the 45 mile per hour is acceptable, a posted speed limit of 35 can’t be enforced without approval. Residents just want something done. This entry was posted in Safety, Television, Travel and tagged Carolyn Selby, corvette, drag racing, Georgia, Georgia State Patrol, Gretchen Quarterman, LAKE, Lowndes County, Lowndes County Knowledge Exchange, Paige Dukes, Quarterman Road, Safety, speed humps, speed limit on April 7, 2010 by John S. Quarterman. 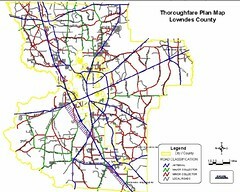 The County Commission is scheduled to vote on a revised Thoroughfare Plan for Lowndes County today at 5PM at 325 West Savannah Avenue, Valdosta, GA. Details are here. The plan as submitted to Commissioners Friday appears to be an early working draft not ready for prime time, including as it does uses of terms that are not defined and quite a few internal inconsistencies, as well as conflicts with the Greater Lowndes 2030 Comprehensive Plan. Commissioners may decide to defer approval until the plan is in better shape. As an example of things in the plan that could use fixing, it proposes to reclassify Quarterman Road from local to minor collector on the basis that within 20 years it might have enough traffic “if it were developed”, despite the Greater Lowndes 2030 Comprehensive Plan showing the same neighborhood as agricultural through 2030. Many other roads are proposed to be reclassified by the new Thoroughfare Plan even though they do not meet the criteria set forth in the same plan itself. The plan might benefit from some additional process or procedural input and review. Fortunately, the Chairman and the County Manager appear to be soliciting input. More details here. This entry was posted in Canopy Road, Development, Lowndes County Commission, Georgia, Politics and tagged Georgia, Greater Lowndes 2030 Comprehensive Plan, Lowndes County, Quarterman Road, South Georgia Regional Development Commission, Thoroughfare Plan, Valdosta on November 10, 2009 by John S. Quarterman. A canopy road, in Georgia, with no curbs or gutters. Sure, it doesn’t go anywhere. Neither does Quarterman Road. Thanks to Bob Clouston for the pointer. This entry was posted in Canopy Road and tagged Canopy road, Georgia, Lowndes County, Noble Jones, Quarterman Road, Savannah, Wormsloe Historic Site, Wormsloe Road on September 12, 2009 by John S. Quarterman. For pictures of what lives in the forest, see longleaf burning gopher tortoises, snakes, frogs, bees and butterflies, spiders and scorpion, and raccoon, and beautyberry, pokeberry, passion flower, pond lily, ginger lily, Treat’s rain lily (native only to south Georgia, north Florida, and a bit of Alabama), thistle, sycamore, palmetto, mushrooms, lantana, magnolia, grapes, yellow jessamine, dogwood, and native wild azaleas. Now let’s go see what they’re doing to the rest of our roads. And schools, and waste management, and biofuels, and industry…. If you’d like to help, please contact the Lowndes Area Knowledge Exchange. 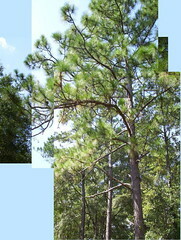 This entry was posted in Amphibians, Arachnids, Beautyberry, Beaver, Birds, Blackberry, Botany, Canopy Road, Cypress, Dogwood, Gopher tortoise, Insects, Longleaf, Lowndes County Commission, Georgia, Mammals, Mushroom, Plants, Politics, Reptiles, Silviculture, Snakes, Treat's Rain Lily, Yellow jessamine and tagged Ashley Paulk, Canopy road, Coppage Road, fire forest, functional classification 9, Georgia, Gretchen Quarterman, Joe Pritchard, John S. Quarterman, Longleaf, Lowndes County, Quarterman Road, rain forest, Richard Lee, rural road on September 11, 2009 by John S. Quarterman. This entry was posted in Canopy Road, Lowndes County Commission, Georgia and tagged Ashley Paulk, Canopy road, county commission, dirt, Georgia, Gretchen Quarterman, hurricane, Lowndes County, paving, Quarterman Road, Richard Lee, weather on September 10, 2009 by John S. Quarterman. The county has put down the lines on the road, so maybe they’re finished with the paving project. Here are drivethroughs with the lines. The ribbon cutting is 10AM tomorrow, Thursday, 10 September 2009, at the north end of the north canopy. If you like trees, come see the ones we’ve got left. From Valdosta go north on Bemiss Road, left on Cat Creek Road, left on Hambrick Road, left on Quarterman Road, and continue all the way around through the canopies until you see people. From Hahira go east on 122, right on Hambrick Road, right on Quarterman Road, pass the subdivision and the fields, and you’ll see people. This entry was posted in Canopy Road and tagged 8 Sep 2009, Canopy road, dirt road, Georgia, Lowndes County, paving, Pictures by Gretchen Quarterman, Quarterman Road on September 9, 2009 by John S. Quarterman. This entry was posted in Canopy Road and tagged 21 August 2009, asphalt, Canopy road, Georgia, Lowndes County, paving, Pictures by Gretchen Quarterman, Quarterman Road on September 9, 2009 by John S. Quarterman. In November 2008, the Lowndes County Commission voted to pave Quarterman Road. Grubbing and clearing happened in December. Paving bids were accepted and decided in March 2009. The county is holding a ribbon cutting at 10 AM this Thursday, 10 September 2009, at the north end of the north canopy. It’s a public event. Y’all come. Don’t be late; the chairman starts things on the dot. This entry was posted in Canopy Road, Lowndes County Commission, Georgia and tagged asphalt, Canopy road, Georgia, grubbing and clearing, Lowndes County, paving, Quarterman Road on September 8, 2009 by John S. Quarterman.